On behalf of the scientific committee we invite psychiatrists, practitioners, psychiatric mental health nurses, psychologists, health scientists, educators, trainers, researchers, managers, and policymakers engaged in the prevention, management, research into violence and aggression in mental health and intellectual disability settings to attend the 10th European Congress on Violence in Clinical Psychiatry to be held in Dublin, Ireland 26-28 October 2017. The first congress, held in 1992 in Stockholm – Sweden, was an initiative by Prof. Börje Wistedt, the head of one of the larger psychiatric clinics in Stockholm at Danderyd Hospital / Karolinska Institute. He and his staff organized the congress with him as chairman and Tom Palmstierna as his scientific secretary. The Congress was held at the Swedish Medical Association, attracted 120 delegates who attended a series of lectures and seminars. The second congress in 2001 was organized by the Addiction Center in Stockholm and its head Prof. Stefan Borg and attracted 200 delegates. For the first time the Congress was a joint initiative with the European Violence in Psychiatry Research Group (EVIPRG) founded in 1997. Following the success of this partnership all subsequent Congresses were co-organised with EVIPRG with the aim of bringing the latest science of violence and aggression to clinicians, researchers and managers. London in the Summer of 2003 was the venue for the third Congress organized by Tom Palmstierna and Gerd Nyman, supported by the Addiction Center and Prof. Stefan Borg and involved 185 delegates. From 2005 the Congresses have been organized by Oud Consultancy & Conference Management, chaired by Professors Henk Nijman & Tom Palmstierna in close collaboration with EVIPRG. Since 2011 the World Psychiatric Association (WPA) co-sponsored the meeting. Since 2015 the European Network for Training in the Management of Aggression (ENTMA08) has been a collaborator in the organisation and delivery of the Congress. In line with previous congresses in Vienna (2005), Amsterdam (2007), Stockholm (2009), Prague (2011), Ghent (2013) and Copenhagen (2015) all contributions to the 10th European Congress on Violence in Clinical Psychiatry will be published in a “book of proceedings” reflecting the current state of knowledge about, and research into the prevention and management of violence and aggression in mental health and intellectual disability settings and the training and education of staff. The 10th European Congress on Violence in Clinical Psychiatry is co-organized by the European Violence in Psychiatry Research Group (EViPRG) & the European Network for Training in the Management of Aggression (ENTMA08), and is a World Psychiatric Association (WPA) co-sponsored meeting. The 10th European Congress on Violence will focus strongly on clinically relevant and practically useful interdisciplinary scientific and practical knowledge with regard to interventions aimed at treating and reducing violence and aggression. The overall congress theme: “Creating collaborative care: a multi-partnership approach” reflects our commitment to partnership working between clinicians, researchers, educators, service users and carers. Accredited for a maximum of 18 Continuing Medical Educational credits by the World Psychiatric Association (WPA), and approval of accreditation is requested from the International Council of Nurses (ICN) for the award of International Continuing Nursing Education Credits (ICNECs). A complimentary welcome reception on Thursday the 26th of October 2017. A special social evening event / Congress Gala Dinner on Friday the 27th of October 2017. (Congress Gala Dinner is at additional cost). 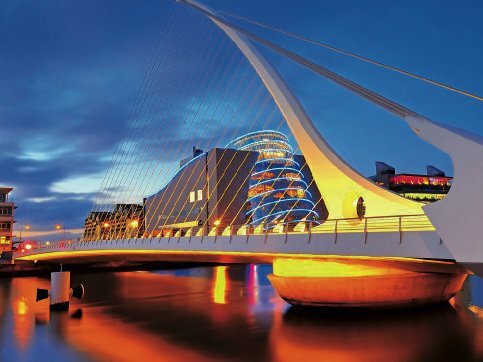 Dublin is vibrant city, and like most modern cities, can be divided into various sectors or quarters, helping you to find the things that interest you with ease. The Medieval Quarter, the oldest part of the city encompasses the area around Dublin Castle, Christ Church and St Patrick’s Cathedral and includes the old city walls. After exploring medieval Dublin you may be in the mood to buy some souvenirs from bygone days, and lucky for you, Dublin’s Antique Quarter is right next door. Dublin is often praised for its Georgian architecture and rightly so. The city has some of the finest Georgian buildings in the world and none are finer than those located in the Georgian Quarter. Otherwise known as “Silicon Docks”, Dublin’s Tech Quarter can be found in the Grand Canal Dock area of the city. The world famous Temple Bar area of Dublin is also known as the Cultural Quarter. Teeming with bars, restaurants, music venues, hip boutiques and second hand shops, Temple Bar is a highlight of any visit to Dublin. Running behind Dame Street, this quarter links the Georgian, Cultural and Medieval quarters and has its own distinct feel and atmosphere. During the day the busy warren of streets are full of eager shoppers enjoying some of Dublin’s quirky boutiques and its café culture, while by night the area is buzzing with the energy of clubbers and bar-goers. Further we like to acknowledge that the congress is supported by the Department of Transport, Tourism and Sport, Fáilte Ireland (the National Tourism Development Authority), the Lord Mayor of Dublin, the Dublin Convention Bureau and the Irish industry suppliers. Prof. Henk Nijman, Prof. Tom Palmstierna (Chairs of the Scientific Committee of the 10th European Congress on Violence in Clinical Psychiatry), Prof. Joy Duxbury (EViPRG) & Dr. Brodie Paterson (ENTMA08). Mr. Nico Oud, MNSc, N.Adm, RN.